As some of my past posts on this blog, I continue to advocate for amateur astronomers to contribute to professional astronomy by getting involved with backyard amateur astronomy projects. Research isn’t just for the professionals. Amateur astronomers are able to participate in cutting-edge science as well, usually by partnering with professional astronomers in pro-am collaborations. Thanks to their ability to move and observe when and where they choose, amateurs are also often better at tracking asteroids or hunting for new supernovae than many pros. Amateurs are also branching into spectroscopy, splitting starlight into its constituent wavelengths to study the composition of stars and other celestial objects. 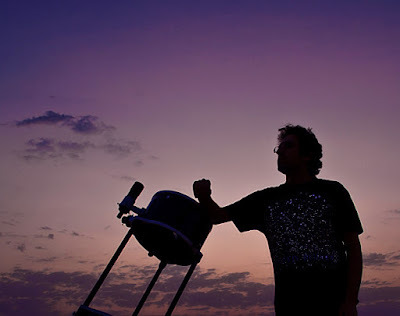 Amateur Astronomer with his Backyard Telescope. Observing Variable Stars - Since professional astronomers often do not have the telescope time needed to follow a particular star or group of stars, the participation of amateur astronomers is often an invaluable means of collecting information. This is very true in the field of variable star astronomy. Since 1911, thousands of amateur astronomers from all over the world and from all backgrounds have contributed observations, one at a time, to make up the more than 18 million data points housed in the AAVSO International Database! Comet Hunting - With a lot of patience and careful work amateur astronomers can, and do, discover comets. Once again, it turns out that professional astronomers simply can't keep watch on everything going on above them. So amateurs have an important role to play. One such comet hunter is Terry Lovejoy, based in Australia. On Aug. 17, 2014, Lovejoy discovered his fifth comet, Comet C/2014 Q2 (Lovejoy). At 14th magnitude, it was as dim as distant Pluto. But as the comet moved in its orbit over the next few months it brightened enormously. Comets are compact bodies of rock, dust, and ice ranging in size from 0.1 to 300 kilometers. They originate from a scattered disc of icy bodies way beyond the orbit of Neptune, and every now and then one will enter the inner Solar System. They're of importance to astronomers wishing to keep an eye on near-earth objects or to study the composition, orbital characteristics, and behavior of comets themselves. Electronically, with CCD imagers which can provide not only rapid discovery information but also serve as a photometer to accurately measure the brightness and color (hence an early indication of spectral type) of the new star. Being Ready for the Nova Event - It is likely that no amateur will be fortunate enough to be viewing, at just the right time, a starfield out of which one star will rapidly increase in brilliance by a magnitude of thousands. The rise to the maximum light of the nova is very fast, requiring only hours to increase perhaps as much as 15 to 20 magnitudes. For discovery work, you should be concerned only about detecting a new nova as soon after the event takes place as possible. Others may jointly discover and report the new star, but it takes no worth away from your discovery. These backyard amateur astronomy projects are just a few mention that has always interested me. Who knows... with some patience and perseverance, you may be the next comet or extragalactic supernova discoverer.